The Kaizer Chiefs MultiChoice team scored six goals while the team from the Soccer Institute scored four goals during this neck-in-neck encounter. The primary purpose of the event was to raise awareness about the HIV/Aids pandemic through football, and to create platforms for high school soccer teams and coaches to receive training and attend coaching clinics. It is also part of a McDonald’s drive to give back to the communities in which it operates. 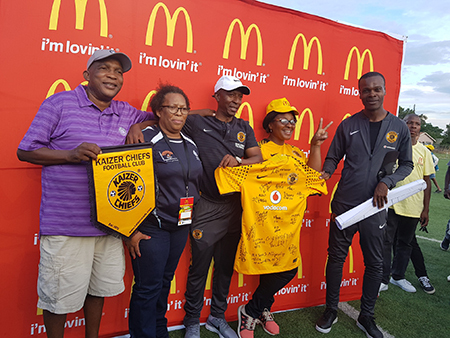 The game was attended by Prof Marilyn Setlalentoa, the NWU’s deputy vice-chancellor for the campus in Mahikeng, Ms Kule Mahumapelo from McDonald’s Mahikeng, and former soccer players including the likes of Sundowns’ Alex Bapela and Kaizer Chiefs‘s Fabian McCarthy. Musicians Arthur Mafokate and Chomee entertained the fully packed stadium before the game. Attending the event were, from left, Shimane Ramagaga, Prof Marilyn Setlalentoa, deputy vice-chancellor of the NWU’s campus in Mahikeng, Donald Ace Khuse, Ms Kule Mahumapelo of McDonald’s Mahikeng and Arthur Zwane.